Buy Stars in Shadow and get the games download now! Stars in Shadow is a turn-based 4X science fiction strategy game. Explore the stars, settle distant worlds, and build an interstellar empire. Recover ancient technologies and negotiate with alien leaders. Created by a pair of passionate strategy gamers, Stars in Shadow features streamlined empire management, sophisticated turn-based tactical combat, and detailed world building. Epic Scope: Starting at the dawn of interstellar travel, progress through four eras of technological advancement. Discover the science of planetary terraforming, upgrade your infantry battalions to battle mechs, and grow your fleet from a squadron of destroyers to an armada of planet-destroying Dread Stars. Varied Factions: 7 Playable factions comprising six alien races. Each faction has different research strengths and technology options. Forming alliances, conquering neighboring species, or discovering ancient artifacts may open up additional avenues of research. Choose your race wisely as it impacts which worlds will suit you, what trades or alliances may be offered, and whether or not your neighbors are inclined to trust you. Stylized Setting: A distinctive comic-book art style and an original, detailed universe backstory draw you into an immersive game world. Interact with a unique cast of alien characters, make friends and influence people, or crush your enemies and see them driven before you. Focused High-Level Strategy: Build a vast and varied empire, taking advantage of the unique traits offered by different alien populations and the worlds they inhabit. A streamlined resource and planetary improvement model keeps the game moving even when your empire grows large. Deep Turn-Based Tactical Combat: Face off against your opponents in complex 2D turn-based tactical battles. Counter your enemy’s missile barrage using point defense or interceptors, then close to energy weapon range! 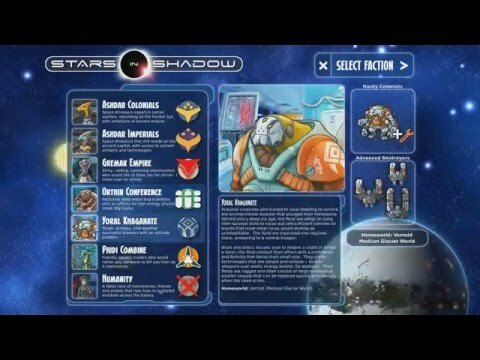 Stars in Shadow’s tactical engine includes several features rarely seen in turn based games. Multi-ship commands keep even large fleet battles fast-paced, and smart unit behaviors allow tight control with minimal micromanagement. Auto-resolve battles that are a foregone conclusion, while retaining the ability to replay any engagement to see exactly what happened. Additional Notes: Stars in Shadow requires the OpenGL framebuffer extension. This extension is present on almost all graphics drivers released after 2010, but laptops made before 2010 with vendor-locked graphics drivers may not be able to run the game.